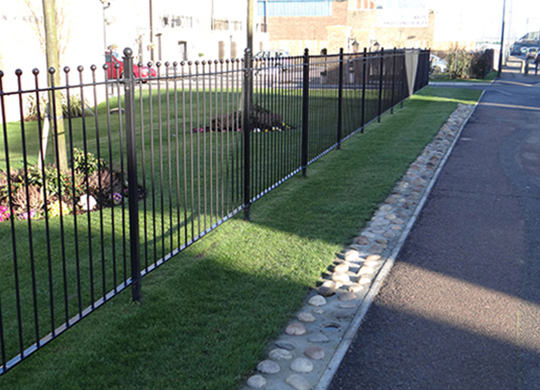 Railings can be manufactured and installed to suit your individual requirements. We provide a wide range of decorative finials used to aesthetically enhance the design of any fencing. All railings are offered with the option of galvanising and powder coating to extend the product durability and meet your specific environment needs. We offer a complete bespoke service alongside a range of railing options, including the popular Bow Top, Vertical Bar and Pedestrian Guard. Bow Top railings feature a distinctive rounded style top. This curved top design offers obvious safety benefits, making it a popular choice in parks, play areas and public spaces. While the Bow Top is designed to minimise risks to young children which may be posed by pointed railings, a range of finials do provide an option for a more decorative finish. The Bow Top railing is a popular choice due to its economical and durable qualities. Its tubular design makes it light, requiring fewer support posts, which makes installation fast and less costly. The Vertical Bar is a robust railing system suited to a wide range of applications. It is hot dip galvanised as standard and can be installed to your exact height specifications. The aesthetically pleasing design can be further enhanced with a choice of powder coated colour options and decorative finials. Pedestrian Guard is classic safety railing features a flat rail top with inline bars. The standard guardrail is manufactured from galvanised mild steel and provides an effective roadside barrier for pedestrians, while maintaining good visibility for motorists. The design can also incorporate a visibility gap below the top rail. Many other design options are available and all our railings are available with matching gates. We offer a huge choice of designs to compliment and co-ordinate, including swing or sliding gates, with manual or automated operating systems. We also offer a complete bespoke service alongside our most popular ranges.